Our toddler activities are designed to promote learning through play. 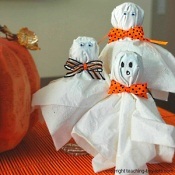 Included below are some of our Halloween activities from Teaching Tiny Tots. 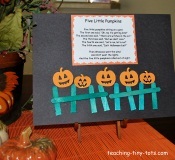 Classic Halloween Poem..Five Little Pumpkins poem with hand motions and make a picture to go with it. 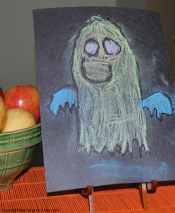 Make a cheery ghost, pumpkin or Halloween picture with chalk and Elmer's glue. 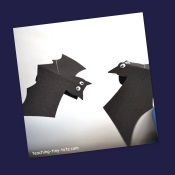 A bat mobile to decorate the classroom or home. Easy for preschool and kindergarten. 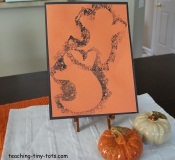 Classic Halloween Craft makes a cute Halloween treat or easy classroom activity. 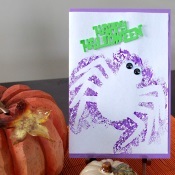 Use sponges and tempera paint to make a card for Halloween. 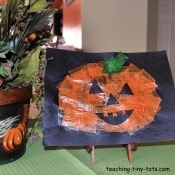 Using diluted Elmer's glue and tissue squares, make a pumpkin with kindergartners. 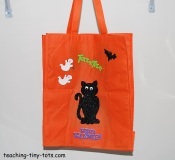 Decorate your own Trick-or-Treat Bag using a recycled bag and tempera or acrylic. Learn some fun facts while carving your Halloween pumpkin. Free Printable! 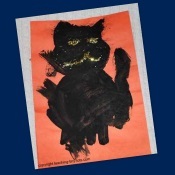 This activity can be adapted for Kindergarten through 4th grade. Halloween is celebrated on October 31. The day is often associated with the colors orange and black, and with symbols such as carved pumpkins or jack-o-lanterns. Halloween activities often include trick-or-treating, wearing costumes, costume parties, visiting haunted attractions, carving jack-o'-lanterns, and reading spooky stories. 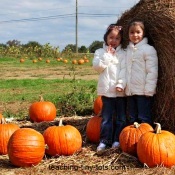 In the classroom I liked to focus on a few fun non-scary stories with activities and doing a pumpkin experiment in groups.